The Avg. Group Discount is 24.7%! 300 newly furnished & renovated guest rooms,20 suites,newly renovated lobby, reatuarant & lounge (2009), pantry store 24 hours, Executive Business Center,Complimentary Internet Services (wired/wireless),Fitness Center,underground secured valet parking,McPherson Metro Subway Station located directly across the street from hotel entrance,located in the heart of DC and walking distance to all Washington has to offer! Location - The Hilton Garden Inn Washington, D.C. Downtown is located in the heart of the nation’s capital, just blocks from the White House, Washington Convention Center, the National Mall, and Ford’s Theater. Hotel Features – The Hilton Garden Inn Washington, D.C. Downtown is a 14-story building with over 300 guest rooms. Hilton Honor Rewards guests can stay for 40,000 points a night. The Hilton Garden Inn received three diamonds from the AAA Diamond Rating Process, appealing to travelers with multiple needs. Properties that have been given the AAA Diamond Rating Process offer upgrades to their guests and a distinguished level of comfort. There is also wireless Internet for all guests offered at no additional cost. Guest Rooms - The Hilton Garden Inn Washington, D.C. Downtown offers a number of different hotel rooms for its guests. Guests can choose from King Bed Evolution Rooms, Suites, and Accessible Rooms. The King Bed Evolution Room offers supreme quality and guests are treated to an LG flat-screen HD TV, ergonomic Mirra chairs, and a speakerphone. Hotel visitors can also relax in their room’s kitchen area where fridge, microwave, and coffee maker are available. Dining – The Great American Grill is the Hilton Garden Inn Washington, D.C. Downtown’s on-site restaurant serving breakfast items, sandwiches, and grill options. Other dining choices include the Pavilion Lounge, which offers meals ready to go and room service. Expert Tip – The Hilton Garden Inn Washington, D.C. Downtown is easily accessible by the Metro’s Orange, Blue, and Red lines. Indoor Pool open 6 AM to 10 PM daily. Breakfast for purchase $16.95 per adult plus tax and gratuity. The Hilton Garden Inn highlights above are subject to change without notice. The graph above is trends of room rates for both group prices and the lowest online individual prices we could find at the time the group/meeting bid was submitted. The lowest group discount displayed is 41.3% in the month of September 2017 and the highest average individual rate is $373 in the month of September 2017. 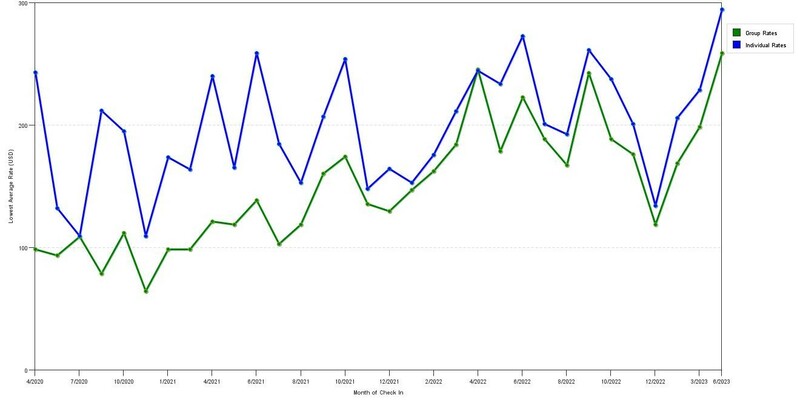 This chart will show past seasonality and also project future months. If you are flexible with dates, you may want to consider staying at Hilton Garden Inn Downtown Dc in a month when rates are lower. 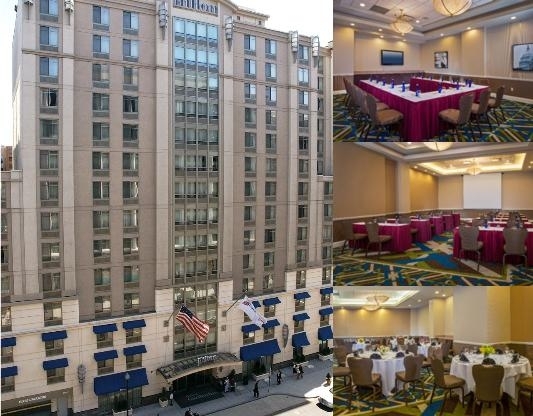 Below are the meeting, banquet, conference and event spaces at Hilton Garden Inn Downtown Dc. 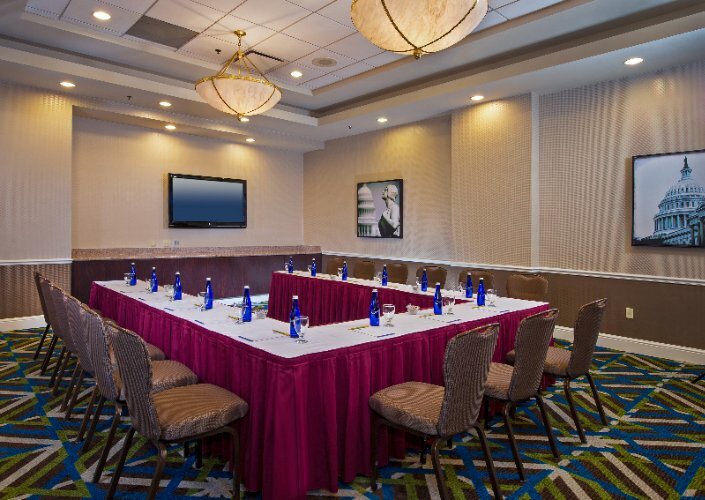 Feel free to use the Hilton Garden Inn Downtown Dc meeting space capacities chart below to help in your event planning. 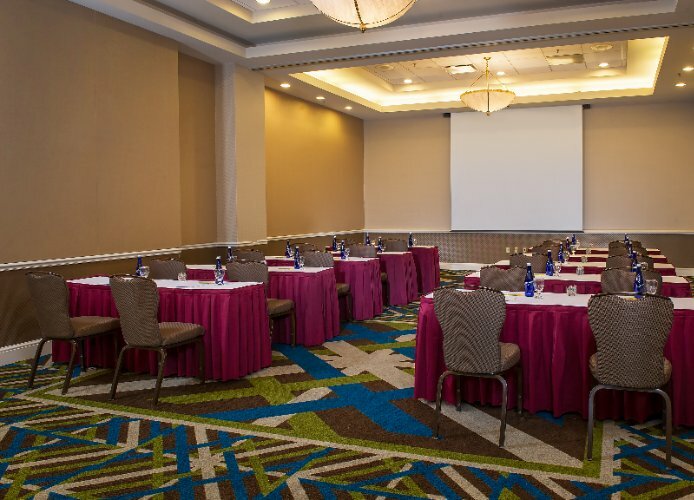 Hotel Planner specializes in Washington event planning for sleeping rooms and meeting space for corporate events, weddings, parties, conventions, negotiated rates and trade shows. 73 x 19 x 16 Ft.
24 x 21 x 16 Ft.
23 x 43 x 13 Ft.
23 x 32 x 13 Ft.
20 x 15 x 13 Ft.
23 x 16 x 13 Ft.
23 x 59 x 13 Ft.